I love comments and trackbacks! To keep these useful for everyone I've added a statement about my policy on Comments and Trackbacks. You can always find the link to this in the footer at the bottom of the page if you have any questions. As you may have noticed I've redesigned my blog format yet again. I've done this in the never-ending quest of making it more reader friendly. It turned out to be an interesting learning experience as I don't know that much about CSS (cascading style sheets). I've widened the columns to take advantage of the fact the most people now are using larger monitors and screen resolutions. Along with this I've made two changes to hopefully improve the readability. First, I've switched the main body font to Georgia and used some CSS spacing techniques to make it easier to read. Second, I've continued the de-cluttering of the sidebars in addition to adding a color background to them to distinguish them from the main body. Like a lot of bloggers I fell trap to the concept of adding a lot of badges and widget to my blog. While all of them are useful to me the reality is they don't mean much to any of my readers. So rather than clutter up the front page with badges and statistics that are of little interest to anyone other than me I thought it would be best to establish a separate page for them. If by some chance you are interested in these you can always find the link in the page footer. Now for a question. On many of my posts I include a photo, usually from Flickr, related to the topic. I've just started using the thumbnail versions to reduce the size so the main page should start opening faster as the older posts with larger photos flow to the legacy pages. Should I keep using photos? Do they add interest and value or just clutter? Let me know what you think. I still need to get a better banner and a new photo but it's one step at a time. Let me know what you think and if you have any other suggested improvements. Thank you for reading. The 12for12k Challenge is the brainchild of Press Release PR owner Danny Brown. Inspired by the way that social media has changed so many lives for the better already with various charity promotions, Danny wanted to do something that was both easy to take part in and have the potential to change as many lives as possible. The 12for12k Challenge started taking shape. With statistics showing that the easier something is to remember and support, the more likelihood of people taking part. If a buzzword or catchphrase can be short and punchy, people remember it - this was the genesis of 12for12k, the acronym for the 12 for 12,000 Challenge. The hope is that by keeping the donation amount small but the donating numbers high, the 12for12k challenge will not only be simple, but doable. $10 per month should be an easy amount for most people to give. One less beer; one less pizza; one less magazine - is it too much to ask for so little that can benefit so many? You can find out more at 12for12K.org plus Danny Twitters about this (Twitter dannybrown) and of course there is a 12for12K Challenge Facebook group. Give what you can. Give what you think is right. You are encouraged to read the policy if you have any specific concerns but the heart of the policy is conveyed in the first two sentences. "I'm not a lawyer so I'm to try to keep this simple and to the point. First, I value your privacy as much as I value mine and I will not violate this trust." The configuration of the preview window was easy and installation was a quick install of some java script on the template pages. The also have 1-click installation of widgets for a number of blog platforms. Let me know what you think of this. Is it something helpful or just clutter? 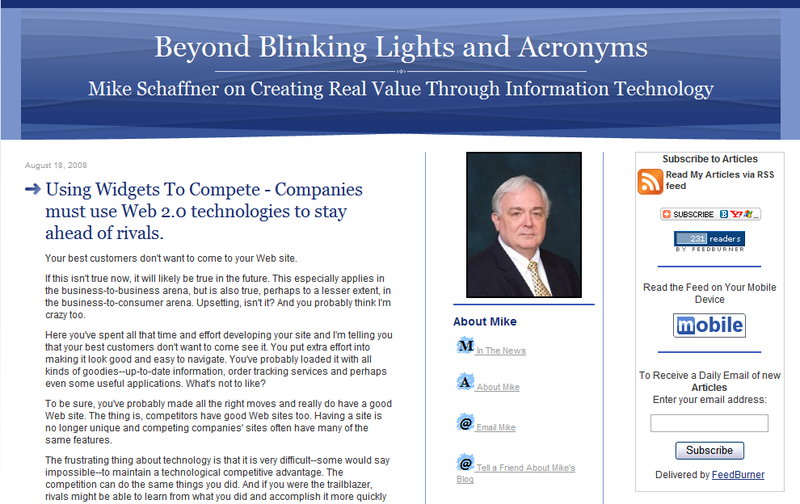 It's official, I'm now on Twitter (MikeSchaffner)! I've been thinking about doing it for some time but to be honest I've been holding back because a lot of it seemed to put it simply, inane. I really don't care what TV show someone is watching nor can I figure out why someone would care what show I'm watching or even what would ever make me think that someone might care. However, things have come together to change my view due to two good friends, Jason Alba and Kent Blumberg. Jason runs JibberJobber, a Career Management 2.0 tool and blogs regularly about career management. A few days ago he wrote "Okay, I’m Sold On Twitter" explaining why he thought Twitter was a great tool in your career management. Then today he had announced his December Personal Branding Winner of the Month - Warren Sukernek which included some pretty compelling reasons on why it makes sense to use Twitter. To top it all off I had a phone conversation with Kent Blumberg today. I met Kent during my job search and he is the one that introduced me to Jason. Kent is a fantastic executive coach so if you in need of a coach for your career (note I said career and not just job search) give Kent a call. Kent is also the one that got me started on blogging so I alternate between loving him and damning him depending on how the blog writing is going. During our conversation he reiterated the benefits and explained that it if someone is blathering you can simply stop following them and that I can Tweet as much or as little as I care to. He closed the deal, I'm in! I spent a lot of this holiday weekend doing some remodeling on this site. Spending a lot of time wasn't what I had planned but as with many remodeling projects that is how it turned out. I made a couple of minor changes and one big change by adding a menu at the top. I placed the "essentials" in the menu to de-clutter the sidebars. Included in this are dropdown menus for Categories and the last 18 monthly Archives and that's where most of the problems were. While I was able to get the menu to work properly the dropdown was shifted way to the right of where it should be. Fortunately Dave Weiss helped me out with some tips and suggestions that let me adjust the CSS (cascading style sheet). I need a new banner design. This stock Typepad design is nice but not great. A new photo of me. I'm not really as serious as the current one makes me look. Publishing the blog directly on mwschaffner.com. As some of you may know I live just north of Houston and we've had some interesting days lately. I appreciate the notes of concern and I'm happy to say that we are all ok.
We "hunkered down" and are now in the process of cleaning up after Hurricane Ike. There was some damage to the house but we got a crane in today to remove a tree from my new skylight (courtesy of Ike) and things are progressing. Phone, internet have returned although no power yet other than what is provided by Schaffner Power & Light. Due to the clean-up and catch-up efforts I may be slow in responding to comments and such. My last Monday's post was preset for publishing as is next Monday's so you may not hear from me for awhile. The hurricane did present some new perspectives on technology reliability which I hope to write about soon. Well it's back to the bunker for more cleaning. This past week or so I've been busy making some changes to this blog. Some are cosmetic, some are new features and some are just "behind the scenes" kind of changes. I hope you like them and I welcome any comments. Listed below are the more significant changes. Back on August 12th in an effort to make things easier for you to read the articles I've set it up so that you can now easily see my articles on your cell phone or mobile device. The folks at Mofuse made this a very simple process for both of us. Simply click on the Mobile badge and enter your phone number or browse to http://BBLandA.mofuse.mobi/ Give it a try. I've also added a way for you to give me feedback via a quick 5 star rating system. But please don't hestitate to also leave comments. The rating sytem is from Outbrain. Once in place is very simple to us, just click on the rating you choose. Installing it however was a different manner. Outbrain provides widget for your blog if you use the standard formats. However, if you use "advanced templates" on Typepad it gets very tricky. Unfortunately, Outbrain doesn't provide a lot of guidance on how to adapt advanced templates. I did contact the support staff and they did provide some help but ultimately I had to figure it out on my own. Time permitting I'll write a separate article on how to do this. I've joined MyBlogLog and have added a widget showing recent visitors to stay connected with MyBlogLog visitors. In an effort to improve readability I've changed the format and theme. This include a new look and shifting the sidebars to the right side with the content on the left. There were also a few other cosmetic changes. The final change was a "behind the scenes" one. I modified my blog to use the Technorati tags as keywords for search engine optimization (SEO). For those of you that have your own Typepad blogs you may be aware the the "keywords" section of your post doesn't really have anything to do with SEO. However, thanks to David Weiss over at TypePad Hacks I found a way to add SEO keywords. Check out "A Creative SEO TypePad Hack" for more information. Time permitting I'll also post more details on this for those of you that are interested. As always I'd love to hear your comments on ways to improve. Thanks for reading. Like The Who in the classic rock song, I'm Going Mobile! In an effort to make things easier I've set it up so that you can now easily see my postings on your cell phone or mobile device. Simply click on the Mobile badge and enter your phone number or browse to http://BBLandA.mofuse.mobi/ Give it a try. I am an IT leader with Engineering/MBA credentials that provide a unique perspective on integrating business and technology solutions to create cost-efficient and process-driven systems and operations.